Clicke here for an article on Charles Walmesley. 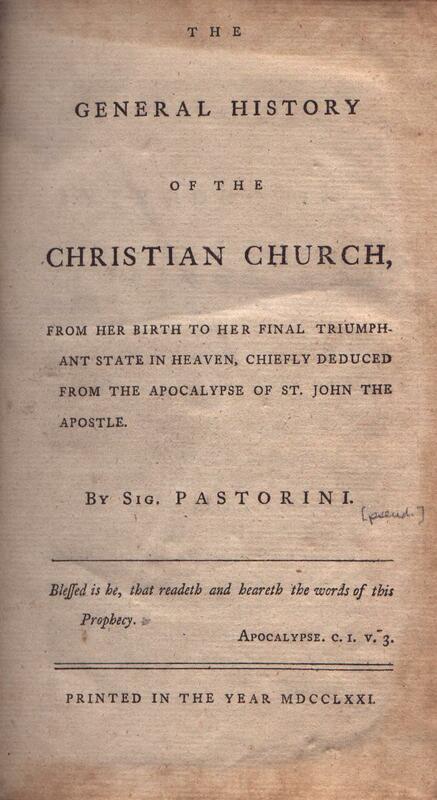 Title The / General History / of the / Christian Church, / From Her Birth to Her Final Triumph- / ant State in Heaven, Chiefly Deduced / from the Apocalypse of St. John the / Apostle. / By Sig. Pastorini. / Printed in the Year MDCCLXXI. 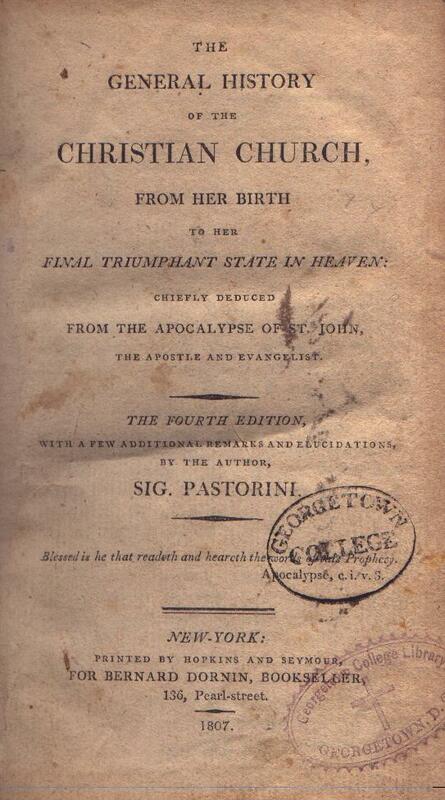 Contents The Book of Apocalypse in the Douay Version as revised by Challoner with extended commentary by Charles Walmesley (1722-1797), Vicar Apostolic (titular Bishop) of the Western District of England, who wrote under the pseudonym Pastorini. 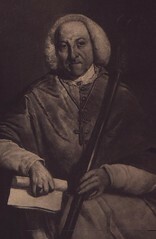 Comments Walmesley's conjecture that the end of the reign of locusts might symbolize a revival of Catholicism to take place about the year 1825 caused a stir in England and Ireland early in the 19th century. Although the Catholic Emanciation Act was passed in England in 1829, there would be no significant religious realignment in the two countries. Title The / General History / of the / Christian Church, / From / Her Birth to Her Final Triumphant / State in Heaven: / Chiefly Deduced from the Apocalypse of St. John, / the Apostle and Evangelist. / The Fourth Edition, / with Additions, not in Any Former Edition; / and Some Remarks and Elucidations by the Author, / Sig. Pastorini. 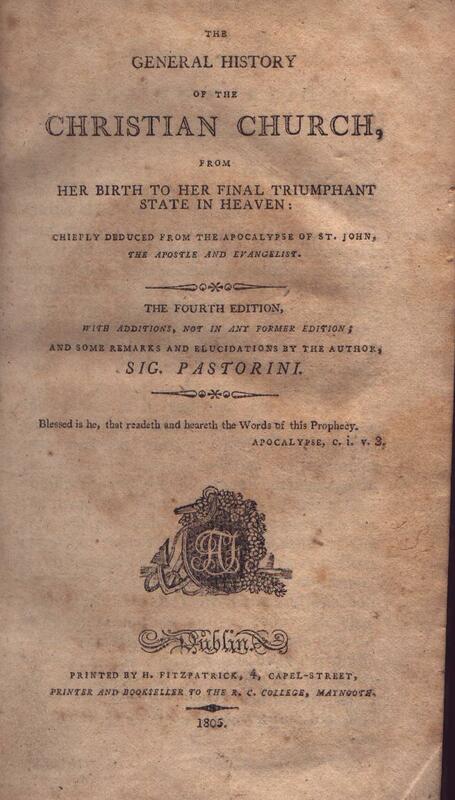 / Printed by H. Fitzpatrick, 4, Capel-Street, / Printer and Bookseller to the R. C. College, Maynooth. / 1805. Comments Published shortly after Walmesley's death, this edition adds a second introduction and material about the French Revolution that had occurred since the first edition. Title The / General History / of the / Christian Church, / From Her Birth / to Her / Final Triumphant State in Heaven: / Chiefly Deduced / from the Apocalypse of St. John, / the Apostle and Evangelist. / The Fourth Edition, / with a Few Additional Remarks and Elucidations, / by the Author, / Sig. Pastorini. / New-York: / Printed by Hopkins and Seymour, / for Bernard Dornin, Bookseller, / 136, Pearl-street. / 1807. Comments The first American appearance of this work. 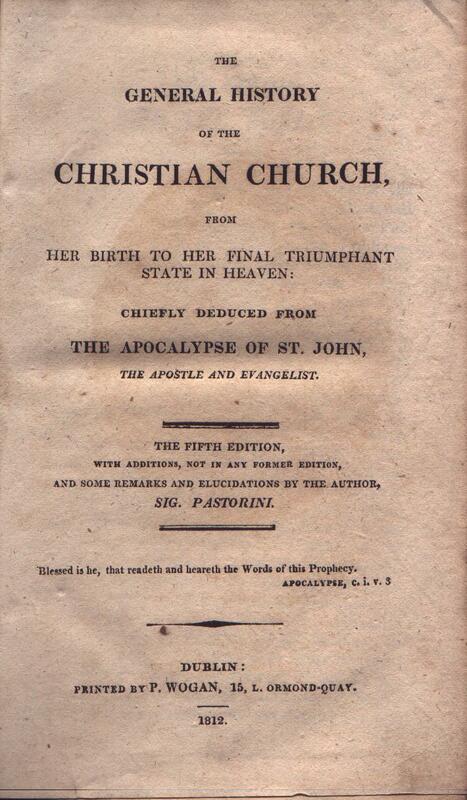 Title The / General History / of the / Christian Church, / from / Her Birth to Her Final Triumphant / State in Heaven: / Chiefly Deduced from / the Apocalypse of St. John, / the Apostle and Evangelist. / The Fifth Edition, / with Additions, Not in Any Former Edition, / and Some Remarks and Elucidations by the Author, / Sig. Pastorini. / Dublin: / Printed by P. Wogan, 15, L. Ormond-Quay. / 1812.